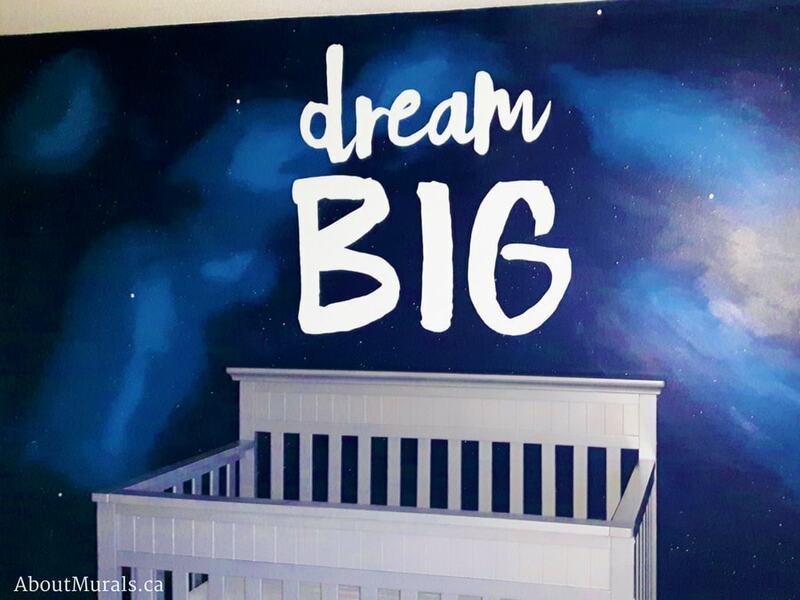 Although this Dream Big mural was painted in Ancaster, Ontario, I also sell cool Outer Space wallpaper murals that ship free in Canada and the USA. They’re super simple to hang and are totally removable when you’re ready to re-decorate! 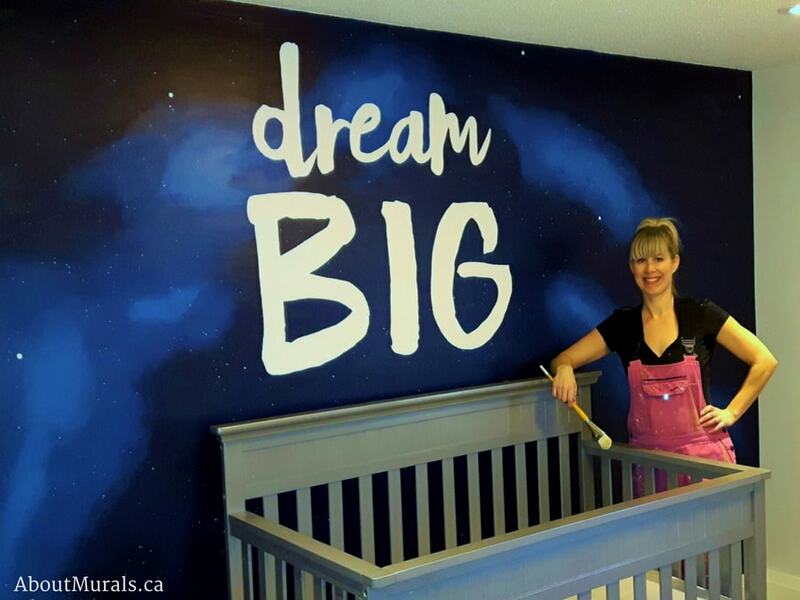 Jacqui wanted a mural that would teach her new baby to reach for the stars. She was looking at wall murals on Pinterest, and found one she loved. There was a tutorial on how to paint the mural, but she was scared she wouldn’t be able to paint the blue 3D outer space sky, so she hired me to re-create the mural. 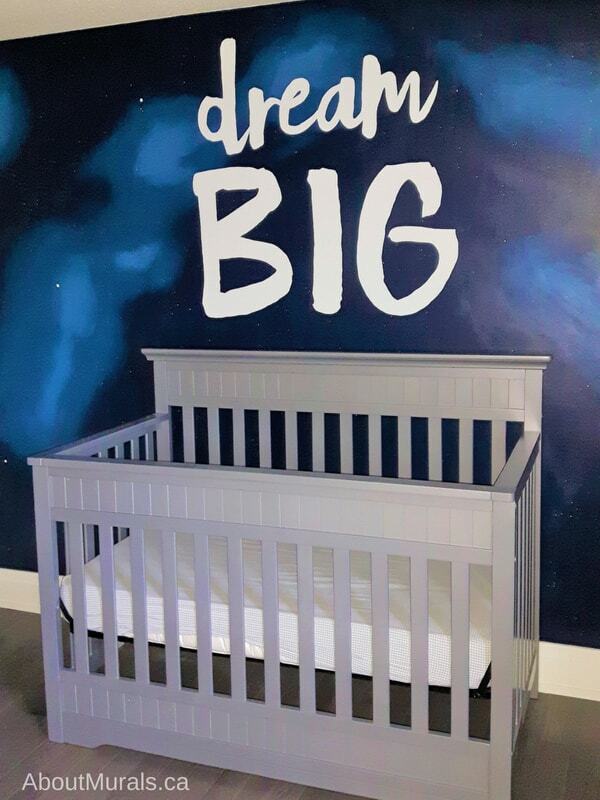 Here are some photos of her baby’s Dream Big mural to help inspire you. I painted the navy blue wall for the dream big mural before adding depth to make it look like outer space and stars. A great way to save on wall murals is to do this step yourself (if you have the time, skills and inclination). After painting the blue background, I mixed the navy paint with white and made three separate containers of different shades of blue. I used this to add depth to the wall mural, making it look like a starry sky in outer space. Instead of “dotting” on each star like the tutorial said, I “splattered” them on the wall by running my fingers across the bristle of the brush. This saved a bunch of time and allowed me to keep the price of the mural down for Jacqui. I’ve been hand-painting kids murals all over Southern Ontario since 2005. I’ve even painted a mural for a Mike Holmes TV Show! Get in touch for a free design consultation and quote. My prices start at $350. Check Out My Removable Wallpaper! I sell cool outer space wallpaper murals that ship for FREE in Canada and the USA. Just like my hand-painted murals, my wallpaper is non-toxic and eco-friendly, so it’s safe for your kids to sleep in their rooms the same day the wallpaper is hung. Do you love a hot deal, coupon codes, DIY tips and inspirational pics of cool rooms? I’d love for you to join my newsletter where I share all that!